It all began with Mark Glazier and his seven-foot Santa Thunder. The Tempe enrollment manager sent us a photo of the custom-made Antlered One in a Santa suit, standing sentry at his desk, and wondered if we would post it on GCU Today. 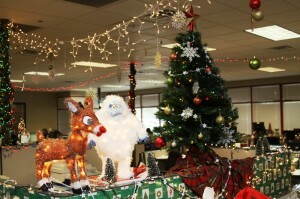 We did last week, inviting others to send photos of their Christmas-themed work stations. The good news: We heard from several people. The bad news: The cell-phone shots weren’t so hot. So on Wednesday afternoon, we took a field trip to Tempe and Peoria to see for ourselves what the season hath wrought. Based on sheer wattage, Tempe is the winner. The place is one big festival of lights, and the most impressive display belonged to the OAR team of Charlene Collier. The team has strung up 20 strands and two grids of lights, requiring five power strips to keep it all going. Not to mention two Christmas trees, 200 ornaments, Santa hats and — get this — each of 10 desktops covered by holiday wrapping paper. They stayed after work last week to knock out the job. Truth be told, this is relatively small stuff for Collier, whose home in Ahwatukee has won lighting-display contests and has an estimated 100,000 lights synchronized with music, all run by computer. Also in Tempe, we saw a marshmallow family of snowmen created by Gail Lafnear’s College of Education team and an impressive international theme at Oscar Crawford’s cubicle. There also was a stuffed elk’s head on one wall, wearing a red Ohio State cap (we didn’t ask). It was a good day to be in Peoria, too, as we witnessed teams putting the final touches on gingerbread houses for a contest later in the day. Tim Johnston’s team built one with a satellite dish — a clever touch — but hands down the most impressive was the one produced by the team of Ty LeRoy. We also liked the wintery wall created by the team of Maria Sanfilippo, Shawna Bolton, Jennifer Hinton, Andrea Lickliter, Sarah Zumido and Holly Enk, but they told us we had missed the boat by not seeing their pirate ship at Halloween (photos of the vessel were striking indeed). A purple tree next to Ardith Brostowicz’s work station on the third floor also looked sharp. So, in summary: Tempe for the lights, Peoria for the arts and crafts. Who knew there was so much red and green in Purple Nation?